HCJ 3103/06 Sholomo Valero v. The State of Israel concerns the fate of assets in Hebron which were purportedly purchased by Moshe Valero, a Jewish man, in 1935. Valero passed away in 1945 and his property was divided between his three children. The petitioners in this case were two of his children and the heirs of the third. As is known, beginning in 1948, the West Bank was under the control of the Hashemite Kingdom of Jordan. As with other assets that were owned by Jews prior to the 1948 war, the assets the petition dealt were vested in the Jordanian custodian of enemy property. After Israel seized control of the West Bank in 1967, the military commander issued an order transferring all property that belonged to the Jordanian state or was registered to it to his sole custody and administration. The Order regarding Government Property (No. 59), issued by the military commander, empowered the custodian of government property in the West Bank to take possession of Jordanian government property and administer it. The petitioners in Valero claimed that the assets should be released to them and that as the state had failed to do so, its possession of the assets must be regarded as expropriation entitling the petitioners to compensation, either monetary or in the form of alternative real estate. The property that was the subject of the petition had been home to Palestinian residents since the 1950s. According to the state, these Palestinian residents had long since acquired rights to the assets due to their long-term possession thereof and protected tenancy therein. The state argued that these rights must be respected both under Jordanian domestic law and under international law. [R]elate to taking possession of and administering government property, as opposed to vesting it in the military commander. The Israeli custodian’s responsibility pursuant to the orders and to international law is to hold government property and administer it within the confines of the purposes of belligerent occupation – maintaining security and normal life and providing for the needs of the protected civilians in the Area. Ostensibly… all the Israeli custodian has are powers to hold and administer government property, including usufructuary rights. According to the law of belligerent occupation, the Israeli custodian may manage enemy assets, but he may not release it or make payments of equal value to the original owners. Unlike the property in the Valero judgment, the fate of some other assets located in a different part of the West Bank was entirely different. This, although the assets had the same traits. We shall now proceed to discuss them. In 2008-2009, not long before the Valero judgment was handed down, four Palestinian families were evicted from the homes in which they had resided for more than 60 years in the East Jerusalem neighborhood of Sheikh Jarrah. The eviction followed the conclusion of lengthy legal proceedings and after it too was completed, settlers entered the homes and have lived in them ever since. The story of the evacuation of the Palestinian families from Sheikh Jarrah begins in the late 19th century, when Jewish families moved to the area after it was bought by the Sephardic Community Council and the General Council of the Congregation of Israel. After the Jordanian legion entered the eastern part of Jerusalem during the 1948 war, representatives of the Hagana [a Jewish underground organization that operated during the British Mandate of Palestine] and the British authorities asked the Jewish residents of these neighborhoods to leave their homes. The Jewish residents left, and the area came under the administration of the Jordanian custodian of enemy property. Later, Palestinian refugees were housed in the homes as part of an agreement between the Jordanian government and UNRWA. After the 1967 war, Israeli law was applied to East Jerusalem. The Law of Judicial and Administrative Arrangements, which was enacted after the war, transferred all assets under the management of the Jordanian custodian of enemy property to the hands of the administrator general in the ministry of justice. The Law, however, did not stop there. Section 5(b) of the Law stipulates that the administrator general must release real estate assets to whoever owned them prior to their transfer to the Jordanian custodian, or to a person standing in for the owner, upon latter’s request. As a result, many assets in East Jerusalem were registered under the names of their previous owners, and in the case of the assets in Sheikh Jarrah – under the names of the aforesaid councils. The two councils launched eviction procedures against the Palestinian residents and later transferred ownership of the compound to “Nahalat Shimon International” – an organization that aims to promote plans for Jewish building and settlement in Sheikh Jarrah. 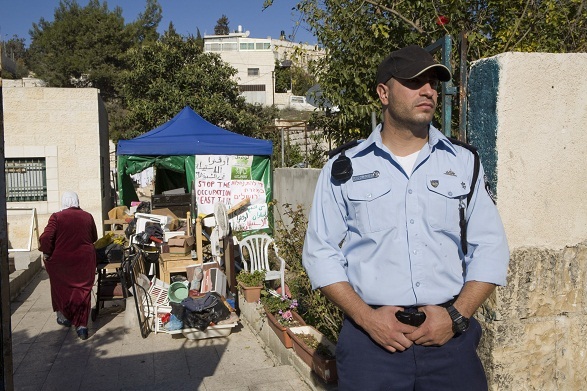 As aforesaid, the eviction proceedings, which began in the 1980s, eventually culminated in the removal of the Palestinian families in 2008 and 2009 and the entry of settlers. The Judicial and Administrative Arrangements Law thus created a unique mechanism, whereby East Jerusalem assets that were held by the Jordanian custodian of enemy property until 1967 are transferred directly to the Jews who owned it before 1948. Once the owners prove their ties to the property, the administrator general must transfer the property to them, without any discretion. Despite the fact that Section 5 of this law concerns the same “type” of assets that were reviewed by the HCJ in Valero, the outcome is entirely different. What is the explanation for the stark difference between the fates of the two assets? The answer lies in the annexation of East Jerusalem to Israel and the fact that Israel does not consider itself bound by international humanitarian law with respect to the annexed area; unlike Hebron, which is located in an area of the West Bank that was not annexed to Israel and remains under belligerent occupation. However, the law is more complex than Israel’s simplistic position. The annexation of East Jerusalem is a breach of international law, under which, East Jerusalem, just like the rest of the West Bank, has remained occupied territory since the 1967 war. In addition, the Fourth Geneva Convention explicitly establishes that neither partial nor full annexation of an occupied territory may serve to deny its residents’ rights under the Convention. As such, any inquiry designed to determine whether or not actions taken by the occupying power are lawful must be undertaken vis-a-vis the law of occupation, even when the occupying power claims the annexation is lawful. In Valero, the court clarifies that the status of the assets under discussion is that of “government property” that have passed from the administration of the Jordanian custodian to that of the Israeli custodian. The occupying power cannot acquire ownership of these assets, as of any other public property, and may not release them to their original owners. Moreover, releasing the assets to their original owner obviously creates problems in the relationship between the occupying power and the local residents dwelling in such assets (in this case, Palestinians). Under international law, long term residence in, management or farming of such property, gives the residents rights thereto and prevents their eviction. It would be superfluous to note that passing a law that is not designed to meet the military needs of the occupying power or benefit the population of the occupied territory and subverts the occupying power’s obligation to maintain public order and safety is also prohibited, particularly when the purpose of such law is to pave the way for populating the occupied territory with the citizens of the occupying power. The court’s analysis in Valero emphasizes to what extent the arrangement stipulated in the Judicial and Administrative Arrangement Law contradicts international law. The State of Israel used the fact that the area is an inherent part of the country (according to its own position) to pass a law that directly violates the rights of the protected persons. This arrangement has another problematic aspect. Returning assets to their pre-1948 owners is strictly one directional. The Palestinian families who were evicted from their homes in Sheikh Jarrah are Palestinian refugee families who lived in the western neighborhoods of Jerusalem before the 1948 war broke out. Under the Israeli Absentee Property Law of 1950, they cannot reclaim the property they left behind in the areas that became part of the State of Israel after the war. The most these refugees could have received was a meager monetary compensation. Moreover, the Jews who were evacuated during the war from the eastern part of the city, already received alternate housing in abandoned Palestinian property in western part of Jerusalem. And what role do Israeli courts play in this? Since Israeli law applies to East Jerusalem and allows previous owners to reclaim their assets, in the cases that have been brought to trial, the courts have largely focused on the question of the identity of the owners or the rights to which Palestinians living in these assets are entitled, for example, by virtue of their being protected tenants. In the cases where the court found the tenants had been unable to establish their entitlement to these rights, eviction orders were issued. Under the cover of the annexation, Israel has instituted a racist and discriminatory regime that eschews any examination vis-à-vis the standards of international humanitarian law. Because Israeli law has been applied to East Jerusalem, the courts have never been asked to review the issue from the point of view of international law, as the HCJ did in Valero, and have considered themselves obligated to stick to the discriminatory legislative arrangement created by Israel’s parliament, the Knesset. Those who pay the price, are, as expected, the Palestinian residents of East Jerusalem who end up as refugees for the second time in Sheikh Jarrah and other places. The author is a lawyer and legal researcher on human rights in the Occupied Palestinian Territories. Formerly on staff at HaMoked: Center for the Defence of the Individual. Military Order No. 59 regarding Government Property. It should be noted that the state’s position in this case is inconsistent with its years-long conduct, which effectively enabled the establishment of the Israeli settlements in Hebron using the exact same technique – namely transferring to the settlers assets claimed to have been owned by Jews prior to 1948; see Chaim Levinson, “Israel Supreme Court Rules Hebron Jews Can’t Reclaim Lands Lost After 1948”, Haaretz, February 18, 2011. HCJ 3036/03 Shlomo Valero v. The State of Israel (2011), judgment of February 6, 2011, para. 45. HCJ 1285/93 Shechter Estate v. Commander of the Judea and Samaria Area (1996), judgment of December 8, 1996 (in Hebrew). See above note 3, para. 54. See Yitzhak Reiter and Lior Lehrs, The Sheikh Jarrah Affair: The Strategic Implications of Jewish Settlement in an Arab Neighborhood in East Jerusalem, The Jerusalem Institute for Israel Studies (2010), pp. 23-24. Legal and Administrative Matters (Regulation) Law 5730-1970. See above note 8, pp. 25-28. See UN Security Council, Resolution 252 (1968) and Resolution 478 (1980); International Court of Justice, Legal Consequences of the Construction of a Wall in the Occupied Palestinian Territory, Advisory Opinion (2004), para. 78. Art. 47 of the Fourth Geneva Convention relative to the Protection of Civilian Persons in Time of War (1949). It is important to note that the provisions contained in this article do not render the annexation of an occupied territory legal. See, Jean S. Pictet (ed. ), Commentary: IV Geneva Convention Relative to the Protection of Civilian Persons in Time of War (ICRC, 1958), pp. 275-276. Accordingly, such assets may be classified, even temporarily pending a peace agreement, as the private property of the Palestinians who have been housed therein and as such protected under Articles 43, 46 and 52 of the Hague Regulations Respecting the Laws and Customs of War on Land (1907). See: Eyal Zamir and Eyal Benvenisti, The Legal Status of Lands Acquired by Jews Before 1948 in the West Bank, Gaza Strip and East Jerusalem, The Jerusalem Institute for Israel Studies (1993) (in Hebrew), p. 127. Art. 43 of the Hague Regulations, see above note 13; Arts. 64 and 49(6) of the Fourth Geneva Convention, see above note 12. See presentation of Adv. Michael Ben Yair, former Attorney General (in Hebrew), in a seminar entitled “Sheikh Jarrah and Israel’s Interests”, held at the Jerusalem Institute for Israel Studies, November 29, 2010. See, e.g., LCA 6239/08 Al-Qurd v. Sephardic Community Council (2008) decision of July 14, 2008 (in Hebrew).